Jayarava's Raves: When Did Language Evolve? This question is one of the most interesting and most difficult to answer of all the interesting questions that scientists seek answers for. Language is one of the defining characteristics of humans. Yes, some animals do have relatively sophisticated signs they use with each other, but language in all it's glory – phonology, morphology, syntax and grammar – is something that sets humans apart. Robin Dunbar's recent book Pelican Introduction to Human Evolution (2014) has a nice little essay on the subject (235-244) that I'll attempt to précis here. When did humans evolve the capability for language? When did humans begin to use language. Before we examine the evidence we need to quickly outline Dunbar's main themes. The book draws on two main fields of research other than anthropology and paleo-anthropology. Dunbar's main work is on what he calls The Social Brain Hypothesis. Dunbar found a correlation between the ratio of neo-cortex to brain size (volume) and the size of groups in social animals. Taking certain other factors into account, the correlation allows Dunbar to accurately predict the average group size for any social animal. In fact social animals occupy the centre of a series of concentric groups of increasing size. For humans it turns out that the numbers are (approximately): 5, 15, 50, 150, 500, 1500. These numbers correspond to structures within human groups. The community has 150 and this is the most famous Dunbar Number. 150 is the mean size of communities in the Doomsday Book for example. (see 70-71 for a range of other correlations). The SBH says we can only keep track of the business (mates, kin, alliances etc) of about 150 other people. We might know 500 by name and 1500 or more people by sight, but we won't know about their likes and dislikes or their relationships with other group members. Chimpanzee's by contrast live in communities of about 50 and don't have the larger groupings. Using this correlation Dunbar is able to calculate what size of groups our distant ancestors lived in. And this leads to the second field of research. Social animals have an extra time pressure that solitary animals do not. As well as feeding, resting and mating, social animals have to socialise, or put effort into maintaining social links. Primates do this primarily by grooming each other (though bonobo chimps also use sexual activity). Grooming causes both partners to produced endorphins, thus creating a sense of well-being. By studying living primates we can see how much time they spend doing various activities and build up models called Time Budgets. In groups of 150 there is simply not enough time to do everything. In order to maintain these large groups we need to do more than eat raw vegetation and pick fleas of each other. Dunbar explores how we might have responded to the time pressure of larger groups. For example cooking food increases the calories available and decreases the amount of time needed for feeding. Singing and dancing together also create a sense of well-being in a group, and do so far more efficiently than one-to-one grooming. Some physical changes associated with language use occur at the same time as changes in our brain size that coincide with living in larger group sizes. So there is no doubt that language use is correlated with changes in the brain, but we're not sure yet whether it was causal and in which direction. Dunbar considers a range of evidence in trying to answer the question of when humans began to use language. Some of it does not tell us much in the long run. For example the lateralisation of the brain—into left and right, with the left side slightly larger—was once seen as an important development. However, it's not language specific. For all we know it might be related to right-handed spear throwing (in humans) and in fact the same lateralisation is present in prehistoric sharks. The emergence of symbolism—as in cave painting and grave goods—has also been seen as significant. The use of symbolism starts around 40,000 bp which is interesting, but post dates some of the other developments (below) very considerably. There is also genetic evidence. But again the genes cited—FoxP2 and MYH16—lack specificity. Because mutation in FoxP2 is associated with speech and grammar difficulties, it's still sometimes called "the language gene". However, for example, mice were recently implanted with the FoxP2 gene and did not start talking. What they did do is learn better, in particularly they found "...it easier to transform new experiences into routine procedures." FoxP2 is now known to be shared with Neanderthals and thus to be at least 800,000 years old (the last common ancestor of Neanderthals and Archaic Modern Humans). MYH16 is even older at 2.4 Million years. Inactivation of MYH16 decreases the size of the jaw and associated muscles. The argument being, though this cannot be substantiated, that it made speaking possible. Thus the genetic evidence is also, to date, inconclusive. Language use being such a complex task suggests that no one gene is going to be more than a tiny part of a larger story. In terms of anatomy we can look at the thoracic nerves, the hypoglossal canal in the skull, the position of the hyoid bone, and the ear canals. Thoracic nerves control the chest and diaphragm and since breath control is required for speech we expect to see significant enlargement of these nerves in modern humans. The hypoglossal canal is where cranial nerve XII, which "innervates the tongue and mouth" emerges from the skull. Both are significantly larger in modern humans than in apes. Sketchy fossil records suggest that Homo Heidelbergensis, Neanderthals and Archaic Modern Humans (AMH) all had human-like values for these nerves. The hyoid bone connects the base of the tongue to the top of the larynx and in humans is positioned low allowing us to make certain sounds, particularly the vowels. Neanderthals also seem to have had low hyoid bones. Finally the ear canals, as well as providing us with balance also allow us to hear. We know that chimp and human canals differ in ways that affect how we hear speech. 500,000 year old AMHs had similar ear canals to humans. The physical evidence suggests that many of the key anatomical changes were in place for humans (and Neanderthals) to start speaking roughly 500,000 years bp. Dunbar notes that this coincides with when the time demands for grooming would have risen above 20% of available time. "it is very likely that a more complex vocal repertoire evolved quite early on in hominin evolution in response to increasing group size." (241). In fact we see parallels in the complexity of some bird calls (chickadees). There is also direct evidence that primate facial and gestural repertoires increase in complexity with increasing group size (241). A key ability some social animals have is the ability to form impressions of the intentions of another animal. This is called mentalising. Social animals need to know the disposition of the other members of their community and have developed the ability to infer this from clues such as posture, facial expressions and tone of voice. One of the main things we do with language is report on other people. If I tell you "Brian likes Mary" you must understand your own mind, my mind, and Brian's mind: that's 3rd order mentalising. No doubt you'd probably wonder whether Mary knows that you know that I told you that Brian likes her, and how she would respond to this and that's 4th order. Humans average out at being capable of 5th order mentalising. This ability to mentalise bares "an uncanny resemblance to the embeddedness of clauses in the grammatical structure of sentences" (242): e.g. Shakespeare attempts to have us, the audience, believe that Othello thinks that Iago is telling the truth when he says that Desdemona returns the love that Cassio has for her. Understanding this play requires the audience to use 5th order mentalising. Shakespeare is revered as a story teller partly because he must have been able to sustain 6th order mentalising. He must have been able to see the 5th order story from our point of view. It turns out that we can estimate mentalising capability from neuro-imaging studies of various primates. We think that Australopithecus would have managed 2nd order mentalising on average. Homo erectus and heidelbergensis averaged 3rd order, but certain members might have reached 4th order. Neanderthals averaged 4th order, but some individuals reached 5th order. And modern humans average 5th order and some reach to 6th order. So it's possible that Neanderthals had language, but it would not have been as sophisticated as ours. We also know that Neanderthals had large brains, but their increase in brain size was mainly in the occipital lobe concerned with eyesight (and their eyes were also larger than ours), whereas as Homo sapiens' increase in brain size was more in the frontal lobes, so Neanderthals may not have been capable of quite the same levels of abstraction as modern humans, but could see well in low light levels. It seems that by 500,000 years ago we had all the physical and mental equipment for using language in place. Archaic humans and (probably) Neanderthals, were anatomically capable of using language. 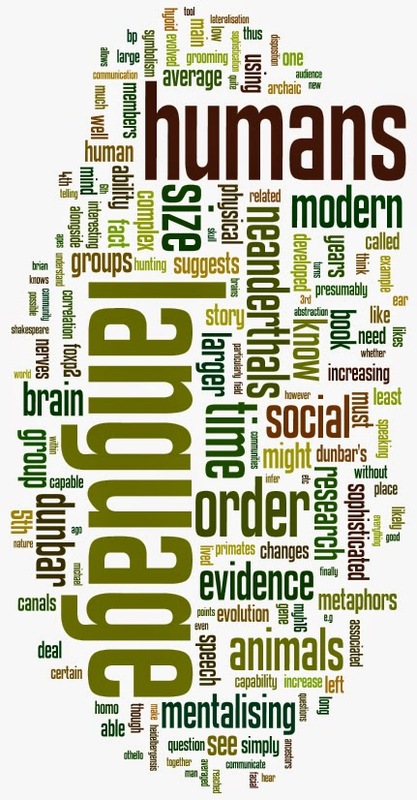 Physical evidence suggests language use at least by 40,000 years ago. Language being a complex phenomenon, we must look for complex conditions related to its evolution. Michael Witzel's study in comparative mythology (See: Origins of the World's Mythologies) suggests that story telling and mythology dates from at least 70,000 ybp. By the time modern humans left Africa they had well developed mythic narratives which involved abstractions and metaphors. I think this points to Modern Humans (ca 250,000-100,000 ybp) using speech in symbolic ways from very early on. Some suggest that language developed alongside hunting of large animals, but just because we hunted together does not mean that hunting was a driver of language, as Dunbar points out: many animals hunt as packs without language. Wolves, orca, humpback whales, and dolphins all use sophisticated, coordinated hunting strategies without the need to sit down and explain everything first. More likely is that complex tool making and use was accompanied by more sophisticated communication, if not fully developed language. We might also usefully consider work by George Lakoff into the nature of metaphor and abstraction. Both are rooted in our experience of interacting physically with the world. I think, but cannot prove, that our hand gestures as we speak are related to the metaphors of interaction we are invoking, that is to say our hands act out the interactions underlying our abstractions and metaphors. Gesture can be powerfully communicative as anyone who knows sign language will attest, and infants can learn to communicate with gestures long before they learn to speak (though the jury is still out on whether this facilitates later language development). The way signers convey metaphors also gives us potential insights into the process of using language to communicate. Language is not simply or only speech. The nature of it must be understood within paradigms of the embodied mind. Presumably at first we talked mainly about our physical interactions with the world and each other. Then we discovered the use of similes: "the man can run fast, like a cheetah"; and then the use of metaphors: "the man is a predator". This progression is creatively explored in literature in China Miéville's novel Embassytown. Presumably this all took a long time. Along with mentalising, this ability presumably also evolved in sophistication over time producing changes that any one generation might not have noticed. Finally out of left field I would like to highlight research into "conversational grunts", these are the non-language sounds (mmm, uh, huh, ah, etc) that we make when we listen to others speaking to let the talker know we are listening. We can actually signify a great deal simply by intonation of a sound like /mmm/: affirmation, disagreement, disapproval, happiness etc. Other research into this kind of area, e.g. sound symbolism, show that communicating, especially our emotional state (and this is extremely important in socialising) can be done without semantics. Language is not simply about communicating abstracts, though fully fledged language has this facility. Through language we communicate our disposition and socialise more effectively: language use allows us to use our time more efficiently. Language seems to have evolved alongside our larger brains and group sizes; alongside tool use and other indicators of increasing sophistication of our minds. It seems the capability was anatomically in place long before we began to use it. The communication of even archaic humans was likely a good deal more sophisticated than modern day apes. Once language did evolve note that it constantly and rapidly changed. Language was almost certainly never a universal. Each language group (unconsciously) adapted language to reinforce group membership and identity. In the extreme we find 1000 of the worlds 7000 languages on the island of New Guinea. Language differences make inter-community communication difficult. Until the advent of civilisation language would have been a defining feature of one's identity. And this might explain why some languages developed very complex grammar that is difficult to learn except from growing up with it. Some of the changes in grammar might be explained by expanded worldviews. Trade links and the possibility of travel outside the range of one's tribe made possible by civilisation and empires, exposed us to strangers. It's worth reading Dunbar's theoretical book in conjunction with something like Jared Diamond's The World Until Yesterday which describes the day-to-day reality of hunter-gatherer life. Dunbar's book is unique in its approach to human evolution. The combination of the Social Brain Hypothesis and Time Budget modelling allow Dunbar to draw a compelling picture of how our distance ancestors might have lived and also when they might have adopted new technologies like fire for cooking, and of course language use. A good deal of the time he is drawing directly on his own research or research conducted by members of his research group at Oxford. While we will only ever be able to infer how pre-historic humans lived from such evidence as has survived the millennia, Dunbar shows that we can obtain much more detail than before. His book takes us from SVGA to HD. Language use is in fact only a small part of the book, but it highlights the kinds of inferences that can be drawn, and of course language use is iconically human (Koko et al notwithstanding). Understanding where we came from and how we developed over time is a key task for understanding who we are now.